Quilty Habit: Goodbye 2015, Hello 2016! 2015 was a fantastic year for me quilting-wise. 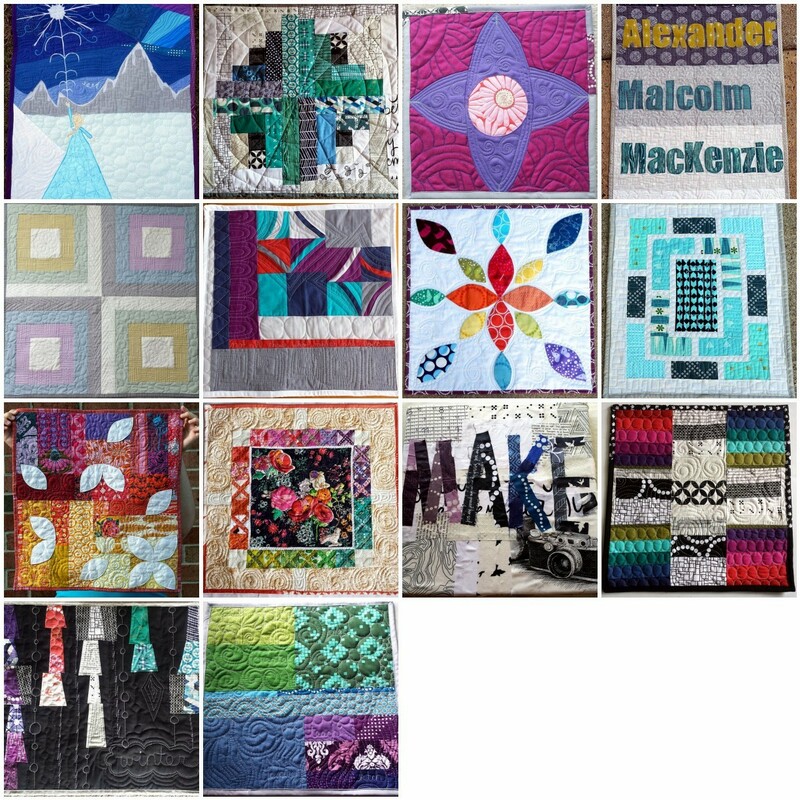 I made 19 quilts (there are a couple I haven't shared yet). 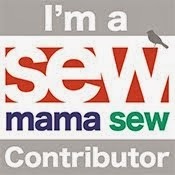 I seriously can't believe it, though before counting I knew it was my most productive sewing year yet. I see three patterns: movement in the piecing, lots of improvisation, and bright fabrics. Just my cup of tea. I made a lot of what I WANTED to make this year, and it feels sooooo gooooood. Cheers! If you'd like to see the blog post for any of them, click the link above to go to Flickr and see the post link in the photo description. This year was also the year of the mini quilt; I made 17 of them (3 are still secrets). I participated in a lot of swaps this year and some of my favorite pieces came out of them. Plus, I made some great friends and furthered my friendships with other quilters. :) I'm not swearing off swaps but I'm definitely scaling back. I also made 5 handmade garments (more about that below), 4 table runners, 3 pillows, and countless smaller projects (not all are pictured below). 2015 was a monumental year in my professional quilting career. It gives me great pleasure to say that hard work has paid off so far! 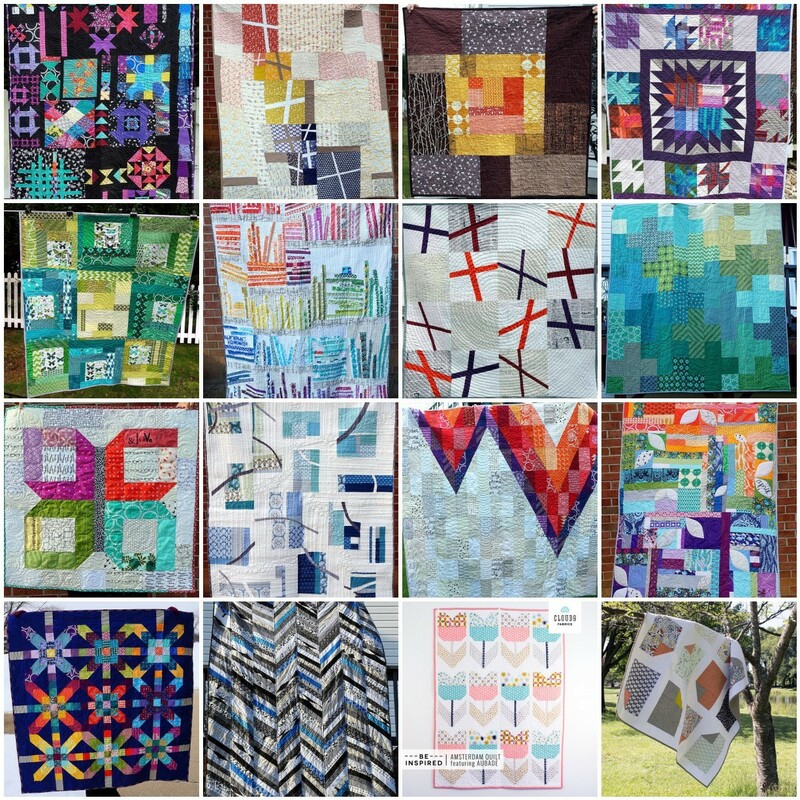 Giving my "Modern Quilting: What's All the Hubbub?" lecture at the CAMACO quilt guild in Cape May, NJ in May. I started piecing and quilting samples for Cloud9 Fabrics for Quilt Market. My quilt "Home" was displayed in the Modern Quilt Guild exhibit at International Quilt Festival, and is going to QuiltCon in February 2016. I'm honored to be included. I taught at both of my local quilt shops, Pennington Quilt Works and Rock Paper Scissors. A huge highlight was the kid's sewing class I taught in the fall. 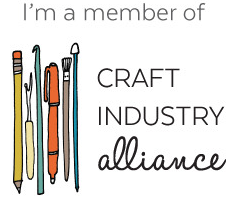 I began a bi-monthly newsletter on modern quilting and community, The Wonky Press, which is an absolute joy to write! Click here to see past issues and to subscribe (the next exciting issue comes out on Saturday). I realized this year how much I LOVE to write - see my top blog posts from 2015 here. I finished out my 2nd year as President of the Central Jersey Modern Quilt Guild and 3rd year on the board and as Webmaster. Passing the torch on feels bittersweet - I have a blog post niggling about in my head about that. I'm so proud to be a part of our guild and all the hard work our board accomplished! Home was at International Quilt Festival! I attended QuiltCon in Austin last February and it was an absolute riot of fun. I had an all around ball at Mid-Atlantic Mod and taught there for the first time. 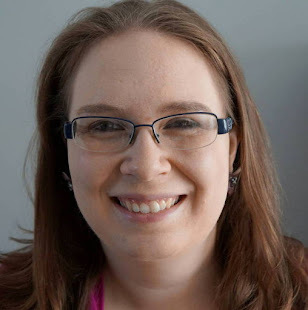 I started the Top 10 Tips series and scoping on Periscope, which are my main ways of contributing to quilt education and community (besides Instagram). I finally started making garments and understanding garment patterns. This has been on my list for a long, long time and I'm making progress. I thought it would be fun (and productive) to reflect on my 2015 goals in order to make my 2016 goals. Finish my Supernova quilt and my Sisterhood quilt. Check! I totally did this!! Two of my long term projects from 2014 are complete - here and here. Finish my epic medallion quilt, and then start another long-term project (possibly x-pluses?). Nope. This didn't happen sadly, but I'm currently working on it! I'm finally inspired and motivated enough to take that sucker out of time out. Learn how to read a pattern and sew at least 3 garments. Check! TOTALLY DID THIS ONE. I have several more garments planned over the winter (we'll see if at least one of them happens). (Musings). I learned this year that garment and quilt sewing are very different and that I go through phases of wanting to do each one. It's so thrilling to make and wear something of my own. Check! Did this too and loving it right now! Instead of actual hand stitching (I've tried English paper piecing and it's not my favorite thing to do), I can cross-stitch. I'm currently working through a Satsuma Street pattern. These are slow-going but totally exciting. Make another Disney mini quilt for my sister, based on the movie Frozen. Check! And it turned out wayyyy better than I hoped. Make a wedding quilt for my BFF and her fiance for their October wedding (we are all so excited!). Check! Will share in the new year when the happy couple receives it. Finish my Doe scrap quilt. Nope. Still stuck on the quilting. I'm not going to rush it! Participate in our guild's quilt-a-long for the year every month. Nope. I did 4 months and that was it. I learned this year that I work best with short term goals. 1. Stay away from swaps. So far, I've been successful. At this exact moment, I have no swaps on the horizon except our end of the year guild swap in January. I just need a break (as much as I love swapping)! 2. Create and produce my first pattern. This is actually in the works. I'm bouncing around in my seat just thinking about it! 3. Pitch article ideas and create projects for more publications. I have some exciting news to share soon about this...! 4. Teach more classes/give more lectures locally and at guilds everywhere! If you'd like an enthusiastic, down-to-earth speaker with years of quilting, teaching, and public speaking experience, look no further than my Classes and Lectures page. 5. Develop the community segment of The Wonky Press. 6. Keep my focus and continue to put myself out there (did I do a good job with #4?). From my real world job search, I've learned how to handle rejection VERY well. I feel prepared for anything. 7. Keep fabric buying to a minimum and REALLY "use what I have." I did better with this in 2015, though I didn't stop buying fabric (which is kind of unrealistic. I do have eyes after all). 8. Try some more simple paper piecing. If the need arises. HA. (Nothing against all you paper piecers, I've tried it a few times and it's just not my favorite!). 9. Decide where to go next in my quilt teaching career. 1. Finish my epic AMH medallion so we can actually use it this winter! 2. Finish my Doe scrap quilt. 3. Finish my 2015 Sisterhood quilt (which should be arriving back at my house soon). 4. Finish my Mod Corsage quilt from Anna Maria Horner's class at QuiltCon 2015. Linking up to the 2016 Planning Party @ Quilting Jet Girl. You have had quite a year! Best of luck in 2016. You've had a great year, I've sure enjoyed seeing each of your quilts over the year. Your goals for next year sound fun too! Wow! You're an inspiration. I can't wait for 2016! 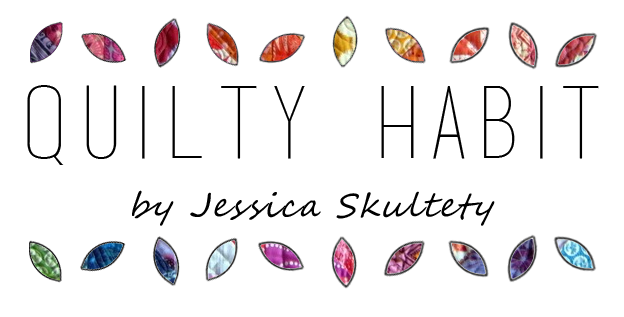 I love reading about your quilty habits! Please, keep up the good work and I look forward to following along next year! 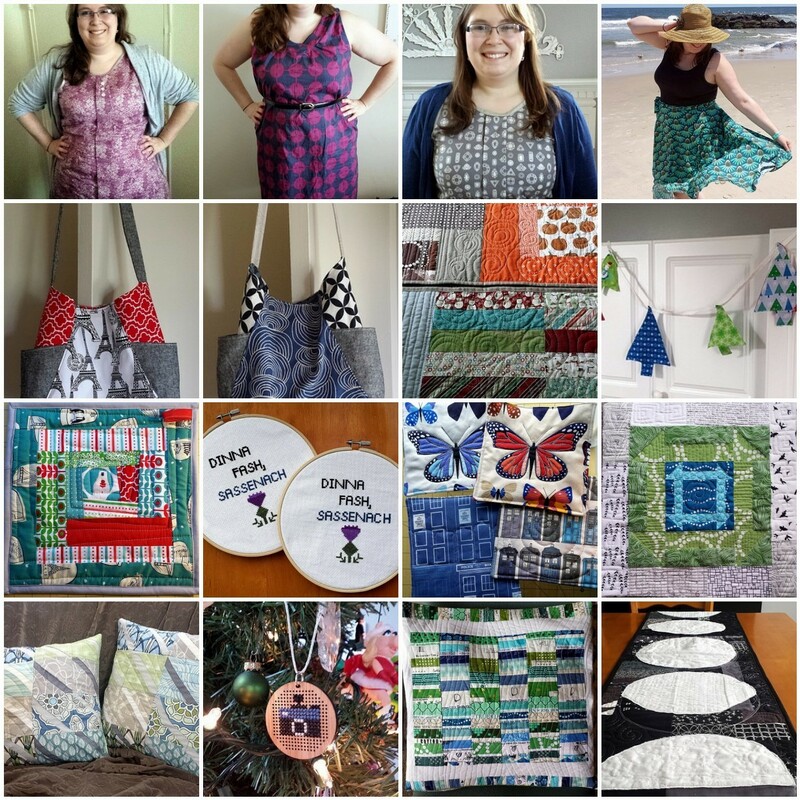 Jeeez that's a lot of quilts and projects! Such a great year for you! And next year sounds even better! What an amazing year you had, Jess. I am so glad you attended QuiltCon and we got to meet and hang out in February. I wish you much joy and success in 2016, and thank you so much for linking up. Love that line "I do have eyes after all" :D Not buying fabric is sooo hard!!! Happy New Year! I hope this one is even better to you! What a list! So many happy things accomplished and so many more in the works. Have a great New Year. You had such an amazing year, congratulations Friend!!! I can't wait to see what you do in 2016. It's bound to be a beautiful year :) I'm looking forward to this pattern and publication you have coming!!!! !